Big game hunting has become a thing of the past due to irresponsible hunters and poachers, but it lives on in the Big 5 slots. Click here to play! 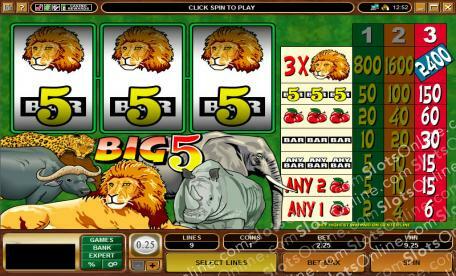 While Big 5 is essentially just a simple 3-reel classic slots game, it has a background theme that features lions, leopards, bison, elephants and rhinos. In the Big 5 slots, you must generally try to line up 3 matching symbols, though payouts can occur for just getting one or two cherry symbols on a payline. The bigger prizes are earned by matching BAR symbols or by coming up with three lion symbols on the payline. Slots players who long to test their mettle against the toughest game of the Savannah will enjoy the Big 5 slots, as will those players who prefer classic slots. There are no confusing extra features in the Big 5 slots, and the paytable is always in easy view.